It’s been more than a month since we’ve returned from our longer trip to Macedonia and I hate to admit it, but up until now, I haven’t made any of the recipes I’ve learned to make when I was there. 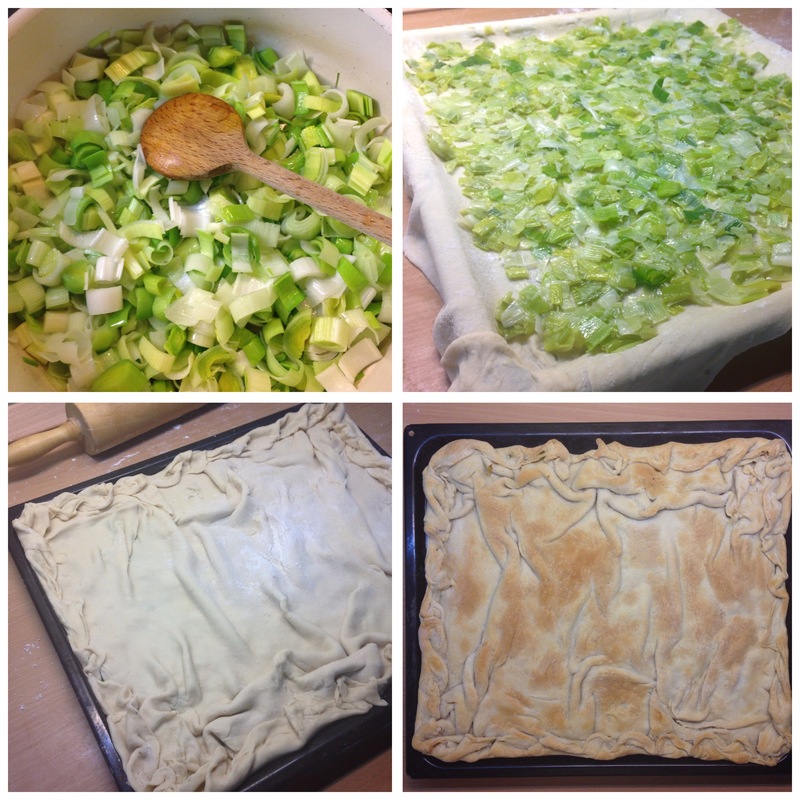 So last week, out of nowhere, I decided it was time to make the “zelnik”, bought a bunch of leeks and planned on making it once in the next few days. Well, that “once” happened to be the same day at 10 p.m. because (as I mentioned in my previous post) I get really impatient when it comes to cooking and want to make everything right away if not sooner. It may not have turned out as perfectly as the one I made in Macedonia under the watchful eye of my boyfriend’s mother, but it tasted really good. For those of you who don’t know, zelnik is a traditional pastry from the Balkans composed of thin layers of phyllo pastry filled with different ingredients, usually combinations of white cheese, eggs, sorrel, browned meat and leeks, sometimes also brined cabbage and spinach, from which the dish derives its name: “zelje”means spinach. 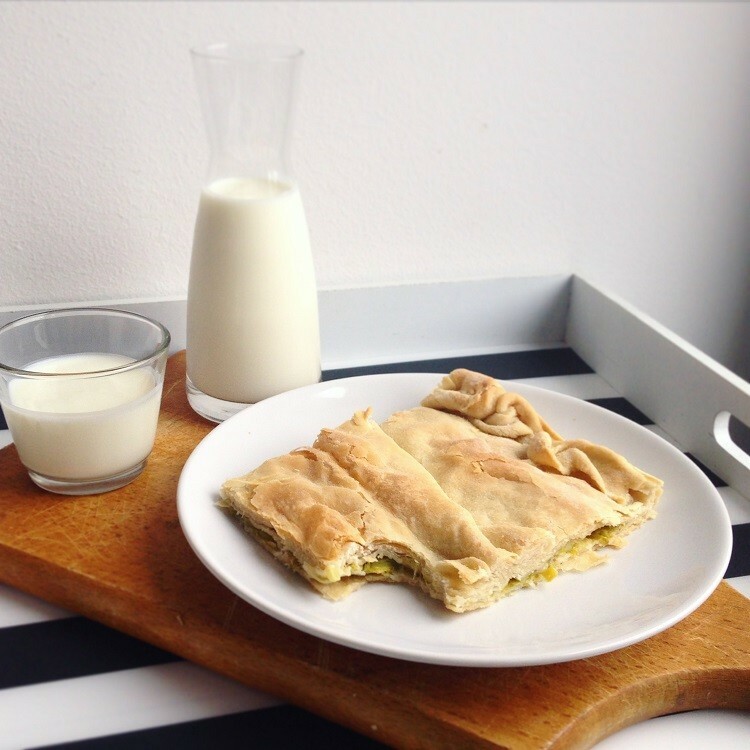 Zelnik is served with yoghurt and is best eaten warm. 1. Place the flour, vinegar, salt and olive oil in a large bowl and mix them together. Slowly start adding warm water and whisk with a spoon until it starts turning into dough. Continue kneading with your hands for 5 – 10 minutes until a really soft dough comes out. Make sure you really put in all your power and then some to really get all the air out. 2. Return to a bowl covered with some flour, cover with a kitchen cloth and let rest at room temperature for 15 minutes. 3. In the meantime, wash the leeks and and cut them in half lengthwise then cut into 1 cm pieces. 4. Heat a medium sized pan over medium heat and add in a tablespoon of butter. Cook the leeks until completely soft then set aside to cool completely. 5. After 15 minutes, take half of the dough out and leave the other half covered. Flour the counter top and roll out the dough as thinly as you can. Spread the softened butter all over it and fold it in thirds, from the right and left side. Butter it again and fold in thirds for the second time, this time from the top and bottom. Butter again, fold in half and set aside. Repeat with the other half of the dough. 6. Wrap each dough in plastic foil and place in the freezer for 15 – 20 minutes. 7. Preheat the oven to 230 degrees Celsius. 8. Take one dough out of the freezer and roll it out thinly on a floured counter top. Make it a little bit bigger than your baking tray. 9. Grease the baking tray with some butter and place the rolled dough on the tray. Cover with the cooked leeks then roll out the other piece of dough and spread it over the leeks in the way that it forms a sort of waves. Fold the bottom sheet of dough over the sides. 10. Bake for 5 minutes at 230 degrees Celsius, then reduce heat to 200 degrees Celsius and bake for 25 minutes. 11. Serve warm with some natural yogurt or let cool down and keep in an air tight container. Heat in a microwave before use.